Kirloskar Institute of Advanced Management Studies recently held a conclave focused on taking the Management Education experience to the next level for the benefit of its students. “Attitude Skills and Knowledge (ASK) and employer’s expectations on skills and employability” was the theme of the conclave that was organized on Harihar campus on the 26th of September. Since it is the Silver Jubilee Year for the institute, several initiatives will be organized throughout the year. The conclave, conceptualized by the Director of the institute and a result of his discussions with faculty members, kicked off the Silver Jubilee year events on a high note. According to Dr. Narayana, “A Conclave is not like a guest lecture; you have to make sure it is a value addition to the student community, faculty and all participants. 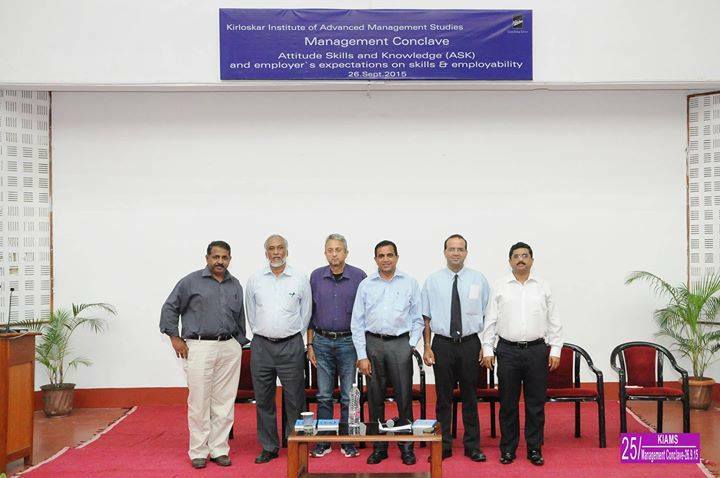 And the key to the success of a conclave like this is getting the best people on board.” With his own years of corporate and academic experience, he managed to do that by bringing together eminent personalities like Dr. Mathew J Manimala, Professor, Organizational Behaviour and Chairperson, OB & HR area, IIMB, Mr. Swami Nathan Krishnan, Vice President and Head – Marketing, Coach and Mentor – Sasken Communication Technologies, and Mr. Shankar G. Rao, Chief Information Officer, BOSCH, Bengalur in the midst. Along with Dr. D. N. Murthy, Area Chair and Professor – Marketing, KIAMS, the Director helped students stay abreast with the latest in the corporate world, while making them realize what corporations and businesses expect out of them. The conclave left students yearning for more and Dr. Narayana did not disappoint with his planned pipeline, “I hope to hold at least three conclaves in this academic year. They will deal with different topics like perhaps Marketing Research, Operations or Finance for that matter. We want to take things to a higher level and set our own benchmark so that we progress effectively.” The students at KIAMShave much to look forward to.